Dr. Batmanghelidj proposed a new paradigm in reading blood pressure. There is no science supporting current methods of blood pressure reading. There is no research demonstrating that Dr. B's suggestion is correct. But considering that what he says is true, it seems logical that it is time for a change in the way we read blood pressures. When it comes to reading blood pressure on patients, many times the professionals do not do it right. If they do not do it right and they are teaching others how to do it, how accurate can the readings be? This is to guide you in how to get a proper reading from a blood pressure cuff and correct blood pressure monitoring. Reading Blood Pressure: Were We Taught Wrong? In nursing school, we were taught to only take the blood pressure reading on the very first try and if we could not get it accurately, we were to wait for a few minutes to take it again. We were taught this not because it was in the books. We were taught this because this is the way our instructors were taught. There was no research based practice. It was simply the belief at the time. Unfortunately, it leads to an inaccurate blood pressure reading. Further complicating this, many do not accurately read the blood pressure because of failing to do the way they were taught. You may see the nurses aids, although taught how to read the blood pressure cuff, they too will do it wrong. You will see blood pressures taken on the wrist (could be elevated by 10 points alone) and on patients soon after they got bad news like they could not go home because their blood pressure is too high (raising it another 10 points, a true story) or while in unattended pain. Add to this a wrong size cuff and the wrong blood pressure reading continues in hospitals around the world. Rarely will you see multiple cuffs used on a floor. Usually it is one size fits all, not quite the way it is taught in schools. Blood pressure is usually read when you are in the sitting position. There should be back support if seated. Blood pressure readings should be taken when the person is relaxed and not right after any stressful events or stressful news. It should be taken in the upper arm and at the level of the heart. They should not be talking when the blood pressure is being taken. Smoking, exercise or drinking caffeinated beverages within 30 minutes before their blood pressure reading can give a wrong reading. The standard of care is to take the first blood pressure reading. If it is above normal, two more measurements are to be taken. The standard requires the measurements be separated by 2 minutes. Most health care workers do not wait the prerequisite 2 minutes. If measurements are still elevated, your health care provider should take blood pressure readings from both arms. An additional measurement may be taken once the patient has been laying, sitting and standing for 2 minutes. Based on Dr. B's recommendations, ideally, it should be taken 3 to 5 times in succession until two pressures are the same. When the blood pressure cuff is tightened on your arm, the brain receives a signal. That signal, increase the blood pressure to compensate for the blockage. 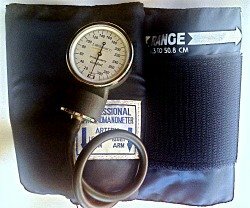 It is not until you pump up and release the blood pressure cuff 3 to 5 times that you will get an accurate reading. The difference in the first reading to the last could increased by 10 points or more. If you have an automatic blood pressure cuff, take your blood pressure 5 times in a row. As soon as it deflates, re-inflate it. Write down the measurements each time. Note what the last three are. You will be surprised at the results.